If you want an epilator predominately for your legs and underarms, then this is the latest device for you from Braun's Silk Epil 7 series. This latest epilator comes with a pivoting smoothing cap for efficient epilating and shaving in one go. 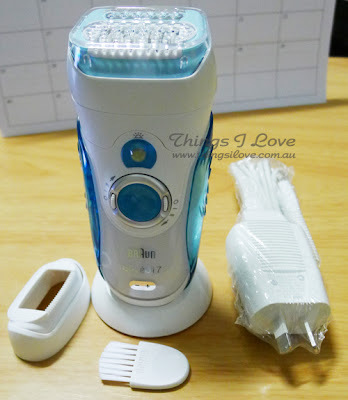 Yes, you read right, it is an epilator plus a shaver on one. I’ll go into more details about its use later. Device wise, It has the same body as the previous model, the Xpressive 7681, but this silk epil comes with mini facelift with a removable turquoise accent cover over the body and turquoise dial making it heaps prettier than its sister. It also comes with different and fewer attachments. Let’s take a look at them. As mentioned, the main epilating head is the smoothing cap with protective cover that has Gillette Venus razor blades on top. The other accessories it comes with is a regular epilation cap for normal epilating on all parts of the body and a charging stand (which the previous model did not have and is handy not only during charging but putting it away on the vanity when not in use). As I’ve reviewed about the functions and features of the Silk Epil 7, I won’t go into too much details again in this post. Instead I’ll concentrate on its unique feature: the dual epilator smoothing cap. What you are meant to do is use this epilator with some shaving aid and in one slow stroke, you epilate the hair, then the two razor blades will closely shave off whatever the epilator didn’t manage to grab. Results- faster epilation because the shaver help to speed up the job removing 96% of hair in one stroke with smoother silkier skin. With this smoothing cap, you won’t be epilating all the hair in one session and will need to epilate during the first 4 weeks once a week to make sure that you actually grab and pull out all the hair. And as your hair actually grow at different cycles in any given time, you will achieve a smoother and more effective with this intial frequent epilation. Once you’ve epilated all your hair after it grows back from the shave, follow up maintenance will only be required every 3-4 weeks afterwards, and you can swap to the epilator cap for full epilation to give long lasting fuzz-free results. Smooth silky feel of legs for the first day after using the dual epilation smoothing cap. Wet use with the silk Epil epilator makes it a more comfortable epilating experience. Great if you have a lot of hair, or your hair is very long and it needs trimming before epilating. 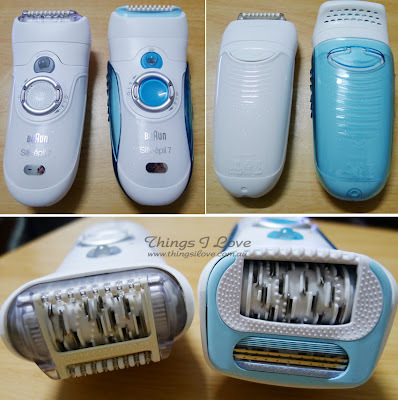 For me personally, I didn’t find the epilator as effective to use with the razor blade add-on as I now have sparse hair after a few sessions of laser hair removal and I ended shaving half of it instead of epilating all the hair. Gets the job done in 10 minutes on legs and is great for last minute grooming that is better than just shaving alone. You’ve already invested in an expensive gadget so forking out more for replacement dual epilator smoothing caps (the razor blades will get blunt over 6 months' use and the blue lubricating strip will change colour to white to indicate wear of the blades) can become expensive. This model has fewer attachments than the Silk Epil Xpressive. I missed using the high frequency massaging system when just epilating which helped to dull the pain alot more (and if was included in this model, it would be the perfect gadget). If you are new to epilation and just want to use mainly large areas like legs and arms and don’t mind not having a massage head to use for more sensitive areas, then you can’t go wrong with the Silk Epil Dual Epilator. RRP A$229. There is currently a A$30 cashback offer until 31st January 2012 from Braun so shop around your local stores (The Shavershop, department stores and other good electrical stores) to get a good deal. I've use Emjoi epilator for 6 month andI must tell you that it was littel painful. So bought the Braun SE7280 Silk-Epil Xpressive and I enjoy it very much. its not painful at all. Can you say which you ultimately preferred? I am trying to choose between the two to use for underarms, legs & bikini line. 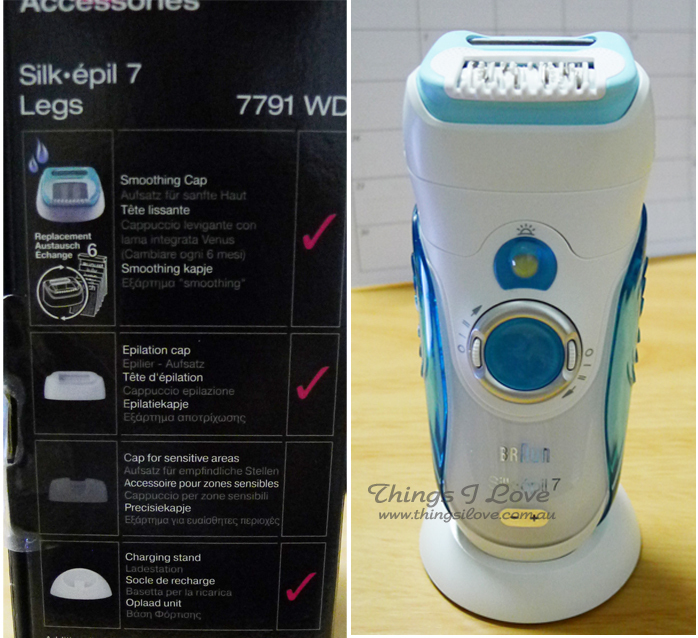 As I am normally not a shaver and have been epilating for the past 10 years, I prefer the Silk Epil 7 as it has the massaging head attachment. If you are a regular shaver, then you may prefer the Epil Duo. It's really up to you. My friend just bought the Braun 7681 and that one seems very good too. do u know what is the diffrence between the silk epil 7 wet and dry vs silk epil expressive vs silk epil xpressive pro? INCREDIBLE! Better than shaving, waxing or IPL/SPL!!! Can u please tell me that after removing hairs from silk epil 7 after how much time the hairs will grew back? I have just started using this and I am OBSESSED. I can't believe I used a razor for all these years. It hurt like bajeezus at first, but after a few times I have gotten used to it and love the smooth results and not having to shave every single day. Underarms still hurt a bit but am sure I will get used to it. It made me pay more but I think it's valuable epilator. If my friends ask what's brand to buy, I will tell them the Braun.